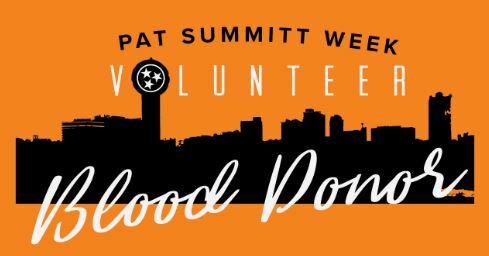 MEDIC Regional Blood Center is once again teaming up with Alumni Hall in an effort to help The Pat Summitt Foundation. In 2017, the three organizations launched a historic partnership to honor former Lady Vols Head Basketball Coach Pat Summitt while also helping the foundation which bears her name. During “Give for Pat Week”, $10 will be donated to The Pat Summitt Foundation for every person who donates lifesaving blood. The money will go directly to help fund patient care, caregiver support, and Alzheimer’s disease clinical research. Last year the effort resulted in the collection of 1,440 pints of blood and raised $14,440. During her coaching career, Summitt was a MEDIC blood donor and often promoted the importance of donating blood. “Pat Summitt did so much for the community including MEDIC,” says MEDIC CEO Jim Decker. “Whenever we needed help, she was there. This event is so special because now our blood donors are able to do something for her and her legacy.” This year’s event runs from Monday, February 5th to Friday, February 9th. This year’s goal is $15,000 – or 1,500 donors. Typically, MEDIC sees around 1,100 donors in a week. Donors are being asked to use the hashtag #GiveForPat on social media when posting pictures of their donation or encouraging other to give.